I am so thrilled to be guest posting on The Life and Loves of Grumpy’s Honeybunch! I’ve made quite a few of Shelby’s recipes and they are all equally amazing! Please head over there to check out the full post and recipe! Have you ever seen a recipe and said, “I need to make this now!”? Well, that’s exactly what happened when I saw a recipe for Pretzel Rolls on a blog. I stopped everything I was doing and immediately set to work making them. It didn’t matter that I had work to do, or that it would take an hour and a half for the dough to rise. I just had to have them. And since the ingredients are just milk, yeast, sugar, flour, salt, and butter I was set to go (if my pantry is low on any of those items I tend to freak out and stock up). And have you ever started making a recipe and realized halfway through that there’s something off with it? Maybe it’s missing an ingredient, or an important instruction? Well, that’s also what happened here. Although I had already started, I switched gears and started following this much better recipe, with a number of alterations I had already accidentally made. I was so happy I acted impulsively and made these pretzel rolls. 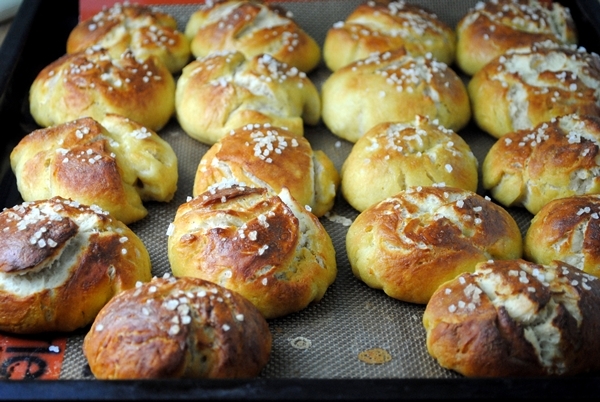 Pretzel rolls, people! They taste like a soft pretzel but act as a dinner roll! They’re unusual and impressive and downright delicious. They take a little time and effort, between the rising time and the boiling then baking, but it’s worth it. Also, the rolls really are best fresh out of the oven and even though we ate them for breakfast the next day, even by then they could do with toasting. I froze the extras and can’t wait to pop them in the oven again! For the recipe you’re going to need to head over to The Life and Loves of Grumpy’s Honeybunch! OMG..Love soft pretzels and these rolls look amazing. Bookmarked. Great guest post! Terrific post – and timely! Pretzel rolls and bread are one of my current obsessions. I’m lucky enough to live within a 20 minute walk of 2 good sources (one bakery, one specialty grocery) but am intrigued with the idea of making my own. Looks like a pretty easy recipe. I’ve got instant yeast on hand so I’d probably skip milk warming part and just mix everything together. Great recipe – thanks. Oooh lucky you! I hope you try making them, let me know how they turn out! Mmmm I am obsessed with pretzel rolls. But they are a bit expensive at the bakeries here (65 cents per roll and up). But you can also buy them here frozen and just pop them in the oven. I heart Germany. 🙂 Will have to try making my own sometime. Lucky you!!! Ah, Germany 🙂 This recipe makes a bunch so I froze some and am looking forward to popping them in the oven some time soon. WOW!!! The rolls look fantastic. I loved the recipe and the last shot of the rolls. Hahaha Nami you are too funny. Thank you! If it was easy enough for me it’s definitely easy for you – you are so talented! Thank you for being a guest on my blog Katherine! 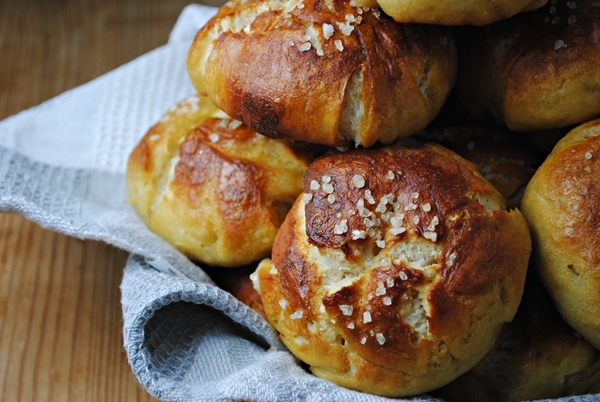 The pretzel rolls look delish! You already know… I love them!!! I know! Next time I will have to try making them as pretzels like you did. So nice of you to guest post for Shelby. This look fabulous! It was my pleasure! I’m such a fan of her blog 🙂 Thank you! wow, the pretzel rolls look so soft and delicious, wish you could eat it straight out of my screen 🙂 love the photos. Thank you Ali! I am so glad you enjoyed this post and the photos. This looks absolutely delicious!Bookmarking the recipe! I made pretzel rolls last year for Thanksgiving after being inspired by a blog as well and they were a total hit! In fact, I’ll be making them again this year and I smell a tradition in the making. Yours look gorgeous and your photography is great.